Fact: Americans love beaches. From Miami Beach to Venice Beach to Coney Island, we love to sit in the sand next to the sea and soak up the sun. We love listening to the waves roll in and we love to watch the sun rise (or set) over the ocean. We have songs about the beach, movies about the beach and clothing designed specifically for the beach. Read the 2017 edition of this study. In fact, Americans love the beach so much, more than a third of us live near one. Although coastal areas account for just 10% of U.S. landmass, they hold 39% of the population according to the National Oceanic and Atmospheric Administration. That’s more than 123 million people. If there’s a downside to our affection for the beach, it’s that those same coastal areas are in high demand and therefore expensive. The U.S. cities with the highest cost of living (Miami, New York and Los Angeles, to name a few) are all located near the ocean, while inland cities are generally more affordable. The same holds true for smaller towns. Median home values in popular beach towns like Santa Barbara, California and Naples, Florida are more than $700,000. Moving to the beach? Find out how much house you can afford. The Gulf Coast. 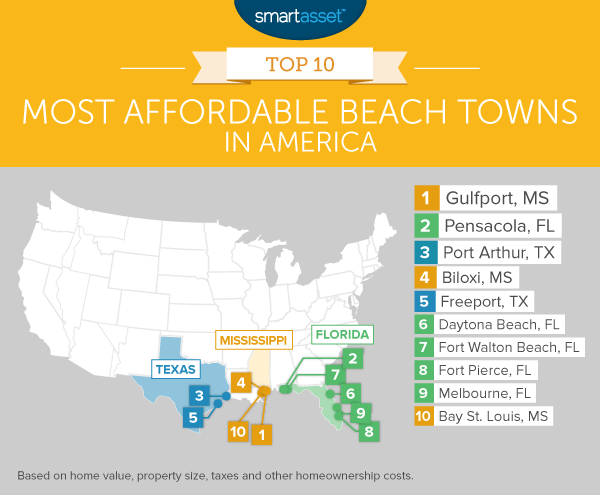 Seven of the top ten most affordable beach towns in America are located along the Gulf Coast, five of which are in Texas and Mississippi. These states have some prime coastal real estate for relatively low prices. Florida. The other five beach towns are in Florida, which has more coastline than any state south of Alaska. While many of Florida’s beach towns are fairly expensive, places like Pensacola are a bargain. The state of Mississippi has just 44 miles of coastline, according to the National Oceanic and Atmospheric Administration, a mere fraction of the coasts in states like Florida, Louisiana and Texas. That may account for why Gulfport is so often overlooked as a beachside destination – and why it is so affordable. According to the U.S. Census Bureau, the median home value in Gulfport is just $120,600. Homeowners in the city also benefit from the relatively low property taxes throughout the state of Mississippi. The typical Gulfport homeowner pays less than $1,000 annually in property taxes. What does that buy you? Well, the city has several miles of white sand beaches located just across Beach Blvd. from its popular casinos and hotels. For an even more scenic beach experience, there is a ferry that runs from Gulfport to Ship Island, a pristine barrier island located about 10 miles off the Gulfport coast. Located at the far western edge of the Florida panhandle, Pensacola is the most affordable of Florida’s many beach towns with some of the best beaches. The only public beach located within the city limits can be found at Bay Bluffs Park, on Escambia Bay. For a truly unbeatable beach experience, the award-winning Pensacola Beach is just a 20 minute drive from the city center. 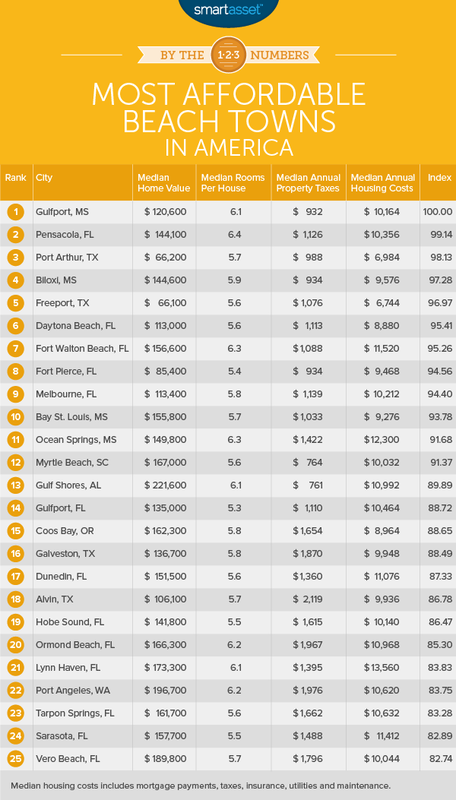 As for the cost of living in Pensacola, the city’s median home value is $144,100, well under the national median. The typical homeowner in Pensacola spends $10,356 annually on housing, including mortgage, insurance, Florida property taxes and utilities. Port Arthur does have beaches, but it offers a lot more than that. It is surrounded by wildlife refuges, including the Sabine National Wildlife Refuge, Texas Point Wildlife Refuge and Sea Rim State Park, which is home to five miles of pristine beach. That means lots of opportunities for birdwatching in the Port Arthur area. The one downside to Port Arthur? The humidity. It is one of the most humid cities in the U.S.
For those who love the beach but hate property taxes, Biloxi may be the perfect choice. The average effective property tax rate in the city is just 0.65%, lowest among any of the top 10 most affordable cities and second lowest among the top 25. That means that for every $100,000 in property value, the typical homeowner in Biloxi pays just $650 in annual property taxes. And what do those low taxes buy you? The city boasts several miles of sandy beaches on the Mississippi Sound, with water temperatures in the 70s or 80s for most of the year. The state of Texas is known for its relatively affordable housing and low cost of living (although Texas property taxes are fairly high). Located just 60 miles from Houston, Freeport is likewise affordable. The average resident of Freeport spends just $6,744 annually on housing, including things like mortgage payments, insurance and utilities. Beach lovers in Freeport enjoy unfettered access to Bryan Beach, an undeveloped stretch of shoreline on the Gulf of Mexico. This central Florida city has one of the country’s most famous beaches. It is also one of the most affordable beach towns in the U.S. According to the U.S. Census Bureau, the median home value in Daytona Beach is just $113,000. That is well below the national average of $175,700. Want to move to Florida? Find out what your Florida property taxes will be. While the median value of homes in Fort Walton Beach is highest among the top 10 most affordable beach towns, buyers in Fort Walton Beach get more value for their dollar. The average home size in the city is 6.3 rooms, larger than the typical beach town. Known as the Sunrise City, Fort Pierce sits along the Fort Pierce Inlet, which connects the Atlantic Ocean with a series of lagoons along the Indian River. Beaches in Fort Pierce include Pepper Park Beach, which is north of the inlet, and Kim Bergalis Beach, south of the inlet. The city is the most affordable in the Port St. Lucie area, with median home values less than $100,000 per year and median property taxes less than $1,000. The mostly-inland city of Melbourne is separate from the entirely-seaside city of Melbourne Beach, but it is a beach town nonetheless – and an affordable one at that. The median home value in Melbourne is $113,400 according to the U.S. Census Bureau. Located just 60 miles from New Orleans, Bay St. Louis is a favorite destination for beach lovers from around southeast Louisiana and southwest Mississippi. In addition to the beach, the city is known for its historic architecture. To find America’s most affordable beach towns, SmartAsset looked at data on every U.S. city with a population between 10,000 and 150,000 residents. We removed from our analysis any town that was not located directly on an ocean (including bays and sounds) or did not have a beach. That left 224 towns, from as far north as Juneau, Alaska all the way down to the many beach towns of South Florida. For each of those 224 towns, SmartAsset considered four factors. The median home value in each town was the first factor we considered. In order to control for variation in home sizes from one market to the next, we also considered the average number of rooms per home in each town. We ranked the 224 towns in our study on each of those factors. We then averaged those rankings, giving half-weight to the average home size in each and full weight to the other three metrics. The town with the best average ranking rated as America’s most affordable beach town. Update: Meeting financial goals like saving up enough money to buy a beach house can be difficult without assistance. So many people reached out to us saying they wanted help with financial planning, that we built a tool to match you with a financial advisor who can meet your needs. First you answer a series of questions about your situation and your goals. Then the program narrows down thousands of advisors to three fiduciaries who meet your needs. You can read their profiles to learn more about them, interview them on the phone or in person and choose who to work with in the future. This allows you to find a good fit while doing much of the hard work for you. Nick Wallace Nick Wallace studied Economics at the University of Washington. He enjoys getting people thinking about finances by looking at the numbers. Nick is a freelance journalist and data analyst living in Michigan. He still lends his economic and analytic expertise for SmartAsset's studies.